Infrared encoded data and images. a) Image of the Afghan Girl (Copyright Steve McCurry/Magnum Photos. Image rights granted by Magnum Photos New York) which is encoded into the plasmonic surface by mapping hole diameter to infrared grayscale. b) Visible camera (EOS Rebel T6i, Canon) and c) infrared image of the encoded MWIR surface taken with a cooled indium antimonide detector (A8300sc, FLIR). The MWIR Afghan Girl encode device is 1 × 0.75 mm2 in size. The same procedure is conducted for the LWIR domain and images to be encoded are d) that of Einstein and a QR code from the author’s website (http:/nanoscience.ucf.edu/chanda). e) A visible camera (EOS Rebel T6i, Canon) and f) LWIR infrared images taken with an uncooled VOx microbolometer camera (HD-1024, St. Johns Optical Systems). The Einstein encoded sample area is 1.25 × 1 mm2, and the QR code is 1 × 1 mm2. Credit: Light – Science & Applications, doi: 10.1038/s41377-018-0095-9. Plasmonic materials can uniquely control the electromagnetic spectrum due to nano-scale surface architecture. Recent advances in nanotechnology and materials science and their combined capacity to develop controlled geometries at the nano-scale continue to evolve, as observed with optical properties of amplitude, phase and wave fronts for materials in optics. Although researchers have focused on individual frequencies and wavelengths, few studies have attempted to control fundamental properties across multiple electromagnetic frequency regimes. For instance, multispectral systems can establish new surfaces with combined functions, such as reflective multilayers that selectively absorb and emit infrared light in transparent atmospheric windows for thermal management. 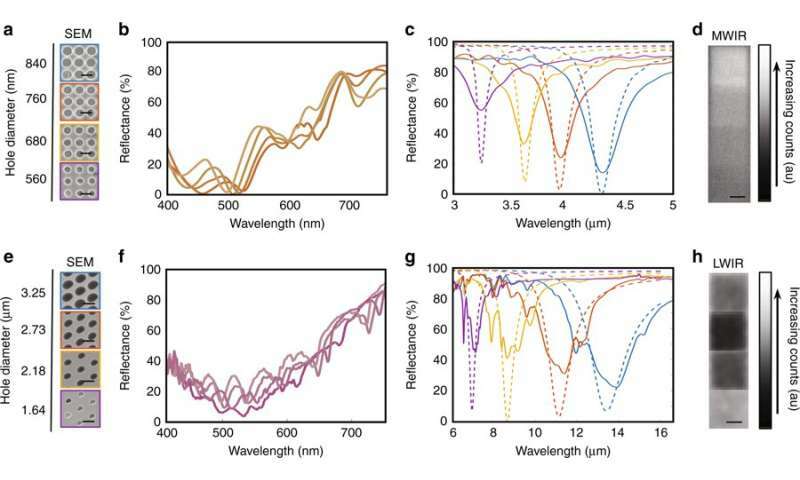 Similarly, plasmonic filters with tunable resonance can be used for multispectral color imaging. These concepts can be applied to achieve camouflage and anti-counterfeiting techniques. Resonances in such systems occur as excited electric and magnetic multipole modes that depend on the geometries and dimensions of constituent materials due to inherent features of plasmon hybridization and plasmon-phonon-coupling. Such traits can be effectively used to engineer optical surface properties of a material. However, attempts to control structural parameters and accommodate a specific spectral regime can influence higher-order resonances in lower-wavelength ranges, resulting in a lack of independent control of optical character in specific spectral regions. 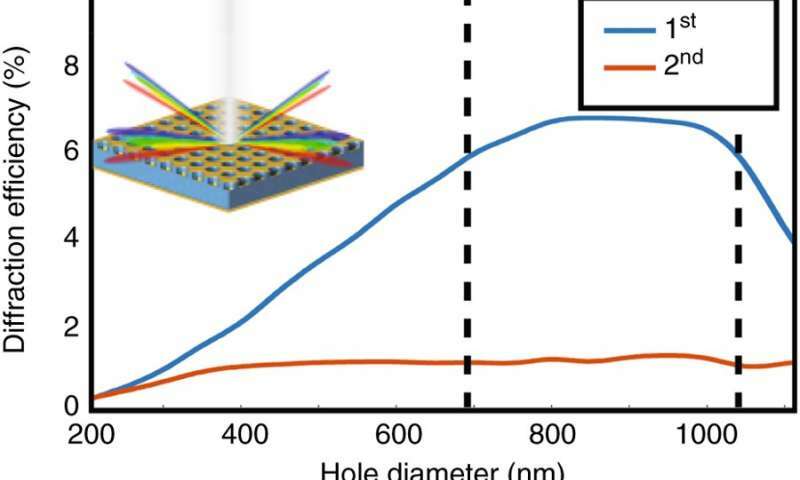 In a recent study, a new device employed plasmonics to control a variety of wavelengths of light using a multilayer cavity-coupled nanostructured system. The plasmonic system maintained continuously tunable absorption throughout the mid-wave (3-5 µm) and long-wave (8-12 µm) infrared (MWIR and LWIR) atmospheric transparency windows, while maintaining near-invariant visible properties. The device was designed and developed by Daniel Franklin and colleagues in the Department of Physics and fabricated with a dielectric layer patterned with regularly-spaced nano-sized holes. By design, the nanostructures were sandwiched between a reflective metallic mirror and a thin upper gold layer with holes corresponding to the middle disc. 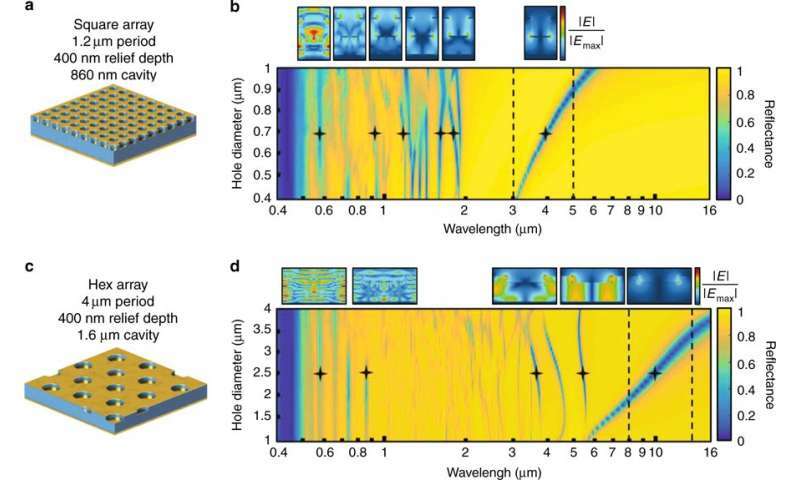 Functionally, the spectral response of the multilayered cavity-coupled nanostructure depended on interactions among plasmonic resonances, diffraction and cavity feedback. The resonance mode of each regime was defined and explored using finite-difference time-domain (FDTD) numerical simulations. The parameters were identified and varied to create an experimental infrared (IR) color palette. Such images were made visible with IR cameras but were concealed in the visible domain by consistent pixel-to-pixel plasmonic absorption and diffraction. The study used a multispectral engineering setup to demonstrate cavity-induced plasmonics for applications in camouflage and anti-counterfeit technologies. The work is now published on Light: Science and Applications. Top-view scanning electron microscope images of the hole diameters of the fabricated plasmonic systems, visible and infrared spectrometer measurements, and infrared images of the a–d) MWIR and e–h) LWIR devices. Solid lines for the reflectance spectra are measured values, whereas dotted lines are obtained by FDTD simulations. Line colors for the visible spectra are obtained from the CIE chromaticity matching functions. Credit: Light – Science & Applications, doi: 10.1038/s41377-018-0095-9. As a proof-of-principle, Franklin et al. encoded images and data onto material surfaces and observed them using infrared and visible cameras to demonstrate the potential of the cavity-coupled plasmonic system. In the technique, the scientists created a map between diameters of a given pixel and grayscale values of the surface to view through infrared camera imaging. The image was first encoded using direct laser writing onto a master template polymer that was used to fabricate the nanostructured surface using nanoimprint lithography (NIL). Before and after the NIL process the three-layered metallic cavities produced were imaged using scanning electron microscopy (SEM) for surface characterization. By varying the laser writing parameters (power and speed) of the master writing process, the scientists obtained a variety of hole diameters for the mid-wave infrared (MWIR) and long-wave infrared (LWIR) devices. Depending on the angle of incident light and viewing angle, when viewed by the eye or using a visible regime camera, the encoded surface appeared as a uniform block of color. Meanwhile the infrared camera showed the encoded grayscale images at a resolution depending on the surface plasmonics. The scientists conducted visible and infrared spectrometer measurements of the fabricated plasmonic systems. The infrared resonant surfaces were imaged using cameras designed for their respective bands of operation. A cooled indium antimonide detector was used to view the MWIR surfaces and an uncooled VOx microbolometer camera was used to view the LWIR surface. Dipolar coupling between the array of holes/disks and their interaction with optical cavity dictated the infrared response. Diffraction in to Fabry-Perot cavity modes dominated the visible regime. Grayscale images and data were encoded into the surfaces by mapping the diameter of holes of the plasmonic system to respective pixels. a) Schematic of the cavity-coupled plasmonic device consists of a backmirror, an imprinted array of holes in a polymer, and a second evaporation of gold to create disks and a perforated film. b) A false-colored scanning electron microscope image of the plasmonic system and a schematic with the various structural parameters. c) An encoded surface where pixel data are mapped to structural features of the plasmonic system. The spectral axis shows how the data can manifest in the desired wavelength range, as shown in the shortwave infrared window, whereas the surface remains uniform in other windows. Credit: Light – Science & Applications, doi: 10.1038/s41377-018-0095-9. When the cavity-coupled plasmonic system was excited at resonance, coherent interactions between photons and the free electron density within the metal produced collectively charged oscillations known as surface plasmons. High-density charge localization and microcurrents resulted from the interactions on the edges of the metallic elements, whose energy dissipated by ohmic loss. 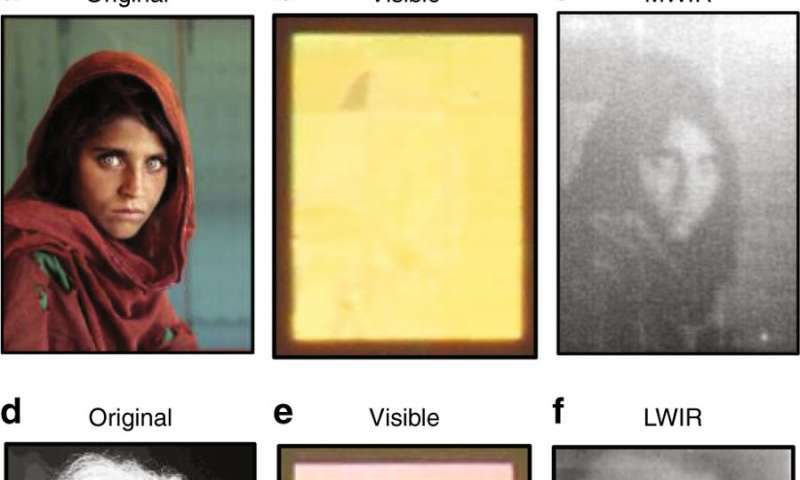 By varying the system's parameters, the scientists encoded images on the surface within a desired spectral range, while these images did not appear visible within others. For example, an image encoded within the mid-wave infrared (MWIR) window, appeared as a grayscale image when viewed through a MWIR camera, although the appearance within the visible range and long-wave infrared (LWIR) regime remained a constant color. Two systems are explored for operation in the mid wave infrared (MWIR) and long wave infrared (LWIR) transparency windows. a) Schematic of the plasmonic device designed for the MWIR and b) corresponding finite-difference time-domain (FDTD) simulations of reflectance as a function of hole diameter. c) A schematic of the LWIR device and d) the equivalent FDTD sweep of hole diameters. Dotted black lines depict the infrared desired range of operation. Hole diameter can be used to sweep through these windows while keeping visible absorption invariant. Field profiles are presented at labeled wavelengths and hole diameters to illustrate the mechanisms behind the resonances in different spectral regimes. Credit: Light – Science & Applications, doi: 10.1038/s41377-018-0095-9. The scientists characterized optical traits of the cavity-coupled plasmonic system in the study and categorized them by geometrical features relative to the wavelength of incident light (λinc). To demonstrate this effect, two devices were primarily defined and simulated in the study led by the research group to operate in the MWIR and LWIR atmospheric transparency windows. The multispectral reflectance spectra of the respective surfaces were calculated as a function of the diameter of the hole using the FDTD method. When the incident light was considerably larger than the pattern, the system behaved as a metallic plane or mirror. As the incident light decreased, extraordinary light transmission occurred through the subwavelength hole-disk array, due to induced plasmon resonance, coupling the electromagnetic wave into the cavity. As the incident light became comparable to the array's structural dimension, the system supported higher-order plasmonic and interference resonances due to the onset cavity-internal diffraction. Using the parameter study, Franklin et al. identified two possible routes to achieve infrared encoding; (i) the diameter of holes and (ii) the relief depth—while maintaining uniform visible absorption. The spectral and order averaged diffraction efficiency of the first and second orders at normal incidence for a) the MWIR device and b) LWIR device. Efficiency is averaged over the visible spectral range of 400–800 nm. Black dotted lines indicate the range of diameters with a maximum deviation of 1%. Insets depict the respective devices and the degeneracy of the first diffracted order based on the symmetry of the array of holes. Credit: Light – Science & Applications, doi: 10.1038/s41377-018-0095-9. The scientists quantified diffraction efficiency in the study for the MWIR and LWIR devices as a function of hole diameter using FDTD. Results indicated that devices could be tuned for different wavelengths; primarily through the infrared transparency windows by modifying the hole/disk diameter and maintaining pixel-to-pixel brightness in the visible domain. The encoded information was not 'invisible' for different wavelengths, in contrast the dimensions of the plasmonic hole-disk system exceeded the diffraction limit of the visible light. Individual features were visible with high magnification objectives. The study combined ease of fabrication and compatibility on flexible substrates to engineer the device architecture. The results will lead to new plasmonic surfaces with multispectral functions to encode information. If it's encoded, did you capture my fuzzy digital encoding based upon captured Lambda and Encoded Lambda as a function of lambda/ (Lambda^n)? OK, at what resolution does one not see that an object is not there; that our observation is observed temporally; thus in reproduction, one has freedom with ... even synchronous events an objects .. so? Light, an observed observation of the field of one or more field centers; but observation is cumulative. We require so much visibility. We missed the invisible centers and how they work. But respond so well to he artist vision, so how do ya wanna decode what is not coded?